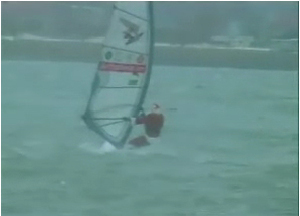 A Santa Claus imposter was spotted attempting to windsurf on the Niagra River, but the wind gods smote him down. This guy is clearly not even an elf. That's the Surfing Santa who was busted by Homeland Security a couple years a go for making an illegal entry into the US. Haha, that's hilarious. I never seen such a thing. What is next, an easter bunny? ?